If you are looking for a low-maintenance plant for garden borders, consider Yucca filamentosa – an evergreen, hardy and drought-tolerant plant. On local nurseries, Yucca filamentosa is available with many different names: Adam’s needle, Spanish bayonet, Bear-grass and Needle-palm. 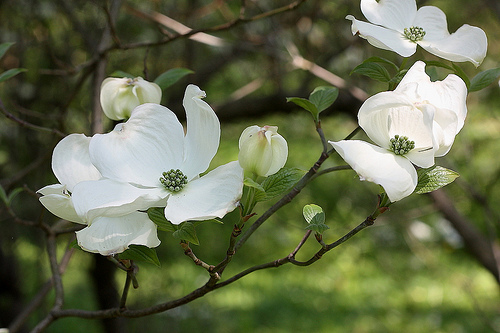 The plant is known for its lovely white flowers and architectural structure that makes it a nice accent plant. Yucca filamentosa thrives in a well-drained soil under partial sun. However, it can easily adapt itself to different types of soil and light conditions. 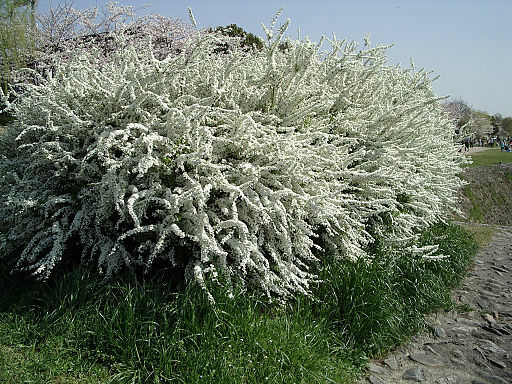 For this reason, it makes a nice plant for gardens and landscapes where it forms small groups of shrubby plants with stem-less structure. A mature Yucca filamentosa can grow up to 1 meter in height and spread across 1.5 meter (however it takes around 20 years to attain this size). 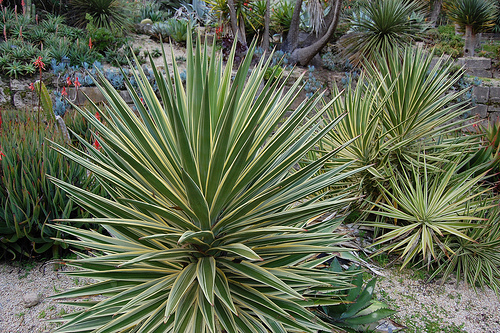 Yucca filamentosa is characterized by its sword-shaped, spine-tipped green leaves that form a tight rosette. The leaves change many shades from winter to spring. 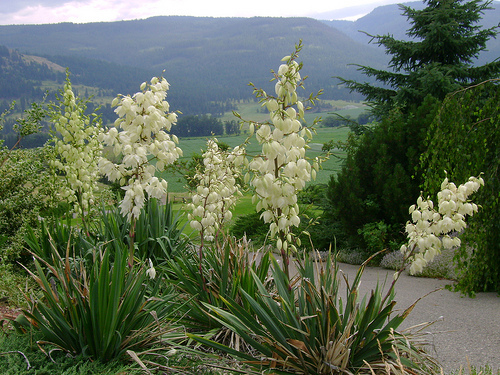 In spring, Yucca filamentosa produces a long stalk of beautiful white flowers. The flowers last for a long time and attract bees and butterflies. Yucca filamentosa ‘Golden Sword’ – similar to ‘Bright Edge’, but larger. Yucca filamentosa ‘Ivory Tower’ – creamy white flowers tinged with green. Yucca filamentosa ‘Color Guard’ – broad yellow stripes all year, plus red stripes in the winter. Abelia is a genus of lovely flowering shrubs from Asia and Mexico. 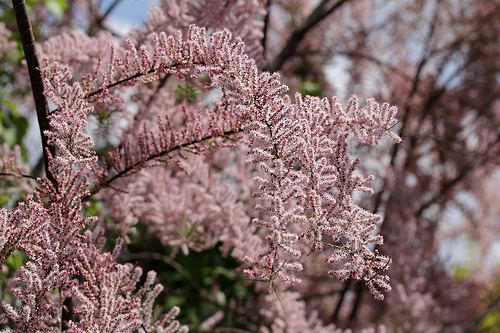 Loved by gardeners because of its compact growth, Abelias are excellent specimen shrubs for gardens and landscapes. The genus of Abelia consists of more than 30 species and many hybrids. 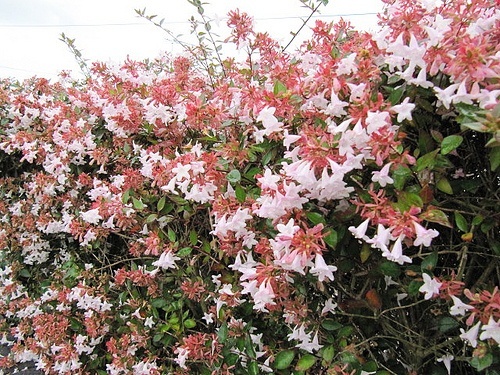 Most species of Abelia grow from 1 to 6 meters and produce attractive glossy foliage accompanied by beautiful flowers of white, pink and mauve colors. Flowers are usually fragrant especially in summer evenings. Abelias can be easily trimmed to form desirable shapes and size. 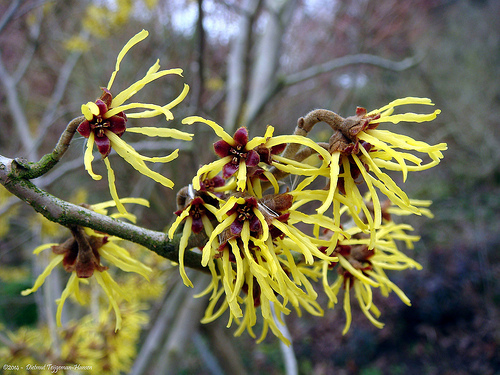 These lovely shrubs are quite hardy and adaptable. 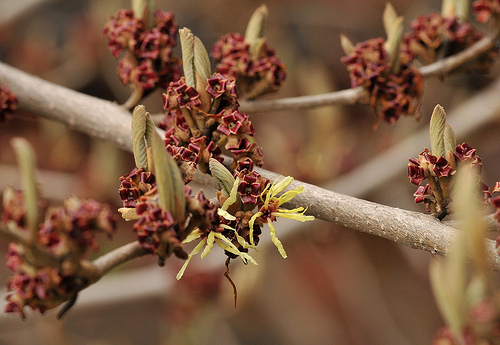 Most species will tolerate drought and frost. Propagated by cuttings, Abelias will go good under full to partial sun. Abelia grandiflora is a medium-sized flowering shrub that grows up to 3 meters and produces arching branches with small glossy leaves. 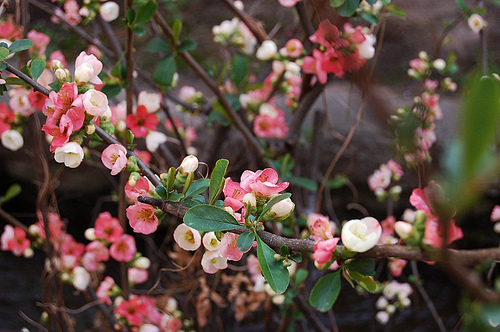 Pink flowers with light fragrance appear in mid-summer. Abelia Edward Goucher is a popular hybrid variety and is grown for its longer flowering period (usually much of the summer till early fall). 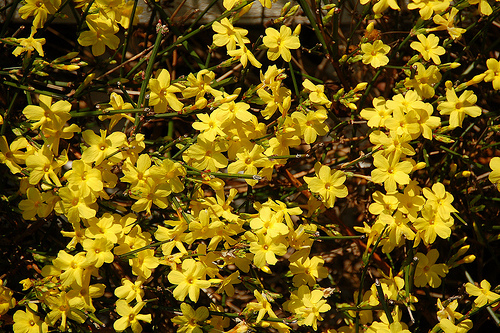 This compact flowering shrub grows up to 5 feet and usually forms dense and rounded shape. 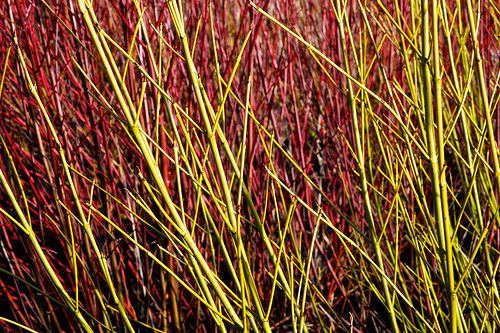 The lustrous green leaves turn to pinkish-purple in winter. Abelia grandiflora ‘Kaleidoscope’ is known for its red stems and bright, golden yellow variegation on glossy green leaves creating a kaleidoscope of color. 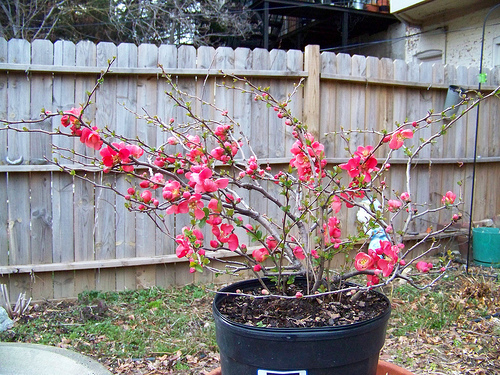 The plant makes an excellent specimen shrub for indoor use. Phygelius is a small genus of ornamental bloomers from South Africa. 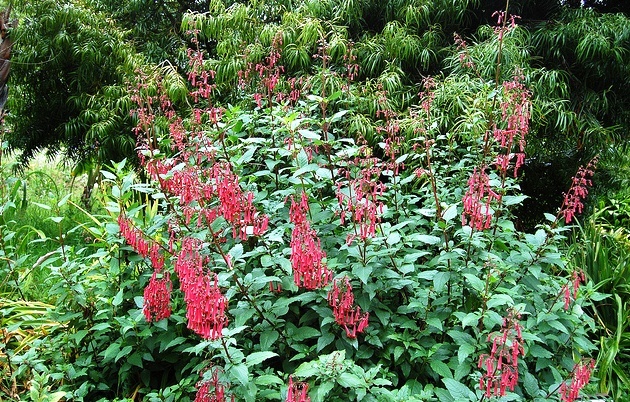 These cold hardy plants make excellent border plants that grow up to 1 meter and produce and produce long spikes of fuchsia-like flowers. They can also be grown in large pots and hanging baskets in semi-shaded or sunny spots. Phygelius are grown as evergreen shrubs or as perennials in colder climates for their ability to produce abundance of tubular flowers that usually appear in summer and stay for a long time. 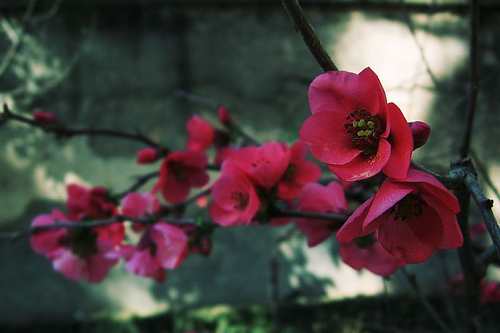 Flowers are orange or red. In their natural habitat, Phygelius grow in shade near water. Therefore, they prefer slightly moist and semi-shaded spots. Phygelius x rectus ‘African Queen’, Phygelius x rectus ‘Sunshine’, and Phygelius x rectus ‘Salmon Leap’. 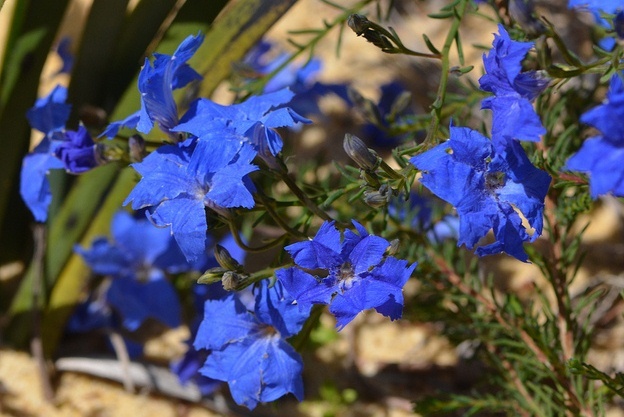 These varieties are usually easy to grow when grown in a slightly moist and fertile soil.